Opportunity Village is now One Vision. Our mission is support individual choice by providing services that lead those we support to greater purpose and independence. What is our vision? To inspire meaningful lives by connecting people with purpose. Our core work is to provide services to nearly 600 individuals with many different needs and abilities in 30 communities throughout Iowa. We support their individual life choices by helping people find jobs in their communities, supporting them in homes that meet their needs and wants, and encouraging them to pursue personal interests. We believe providing this support allows individuals to lead meaningful lives and connect with their purpose. But connecting people with purpose doesn't stop there. Our employees find theirs by discovering a career supporting the success of others. It's a career that truly has meaning for many. 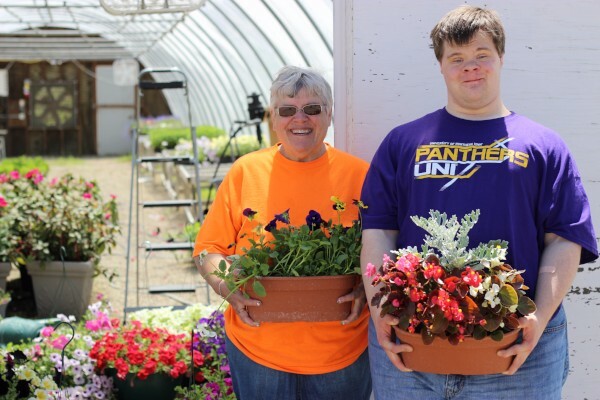 Our volunteers find theirs by playing a vital role in the daily operations of our mission, sharing their talents and skills by working at our General Stores in Clear Lake and Fort Dodge or assisting with Spiritual Life activities. Our donors find theirs as their generosity becomes the difference between One Vision providing standard service and offering the best quality care and support in North Iowa. To learn more about One Vision and the services our organization provides, click on the links at the navigation pane to the right. Interested in applying for services? Our services span Iowa communities including Clear Lake, Mason City, Garner, Forest City, Osage, Eagle Grove, Webster City, Fort Dodge, and Humboldt. For more information about services at One Vision, please contact Teal Ferry, Service Coordinator, at 641-525-2981. Forms for admission are located on the Accessing Services page or from Ms. Ferry directly.